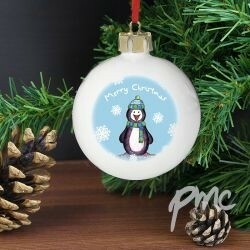 This decorative Penguin ceramic bauble can be personalised with a child's name up to 14 Characters. Please enter the personalisation exactly how you would like it to appear on the bauble. A truly lovely keepsake for your special child. Please allow 5 working days (UK) from placing your order for delivery of your personalised gift.